Nice video Ians. It's crazy how long the leads are for the OEM grips. For those who went with the Oxfords, where did you tap power from? Right off the battery. The Oxfords are fused. Thanks, that's pretty much was I was thinking. For my last installation I was paranoid and still used a shut off relay. This time I think I'll just go direct as you suggest. I have a question for anyone who has the OEM Kawasaki or Oxford heated grips. Do any of you reading this also have a throttle lock? Specifically the friction type at the end of the right grip? I forsee issues with install of that based on the installation video but wonder if anyone has both and how they work? I have experienced the OXFORD and there WARM! And some say the Kawi ones are sleek but not that warm or notice that great difference? Not sure I need them either here depending on our spring/fall this year but like to have all options open. I have a Kaoko throttle lock that I can swap from the C14 to the ZX14 and both have the oxfords and no issues. The TL will also work on the RS. I also have a slim blade type cramp-buster that swaps all the bikes. 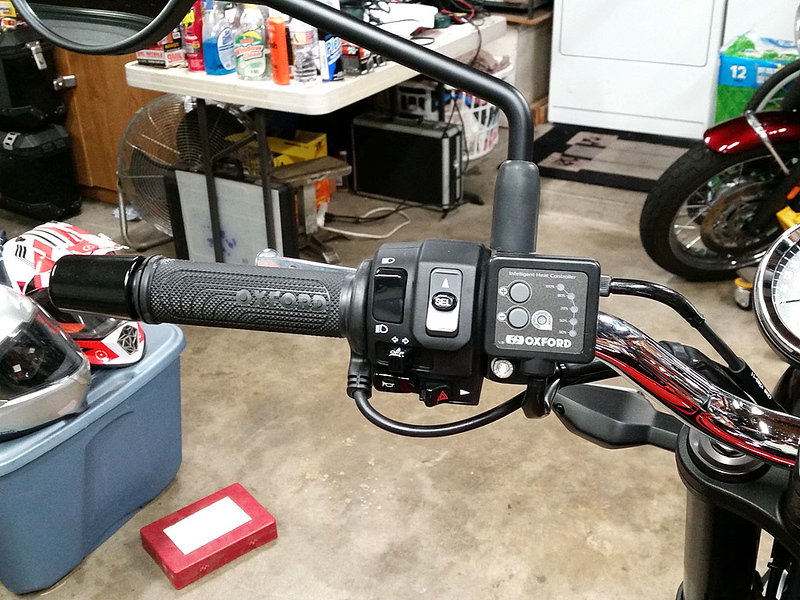 CORRECTION: The C14 has factory heated grips. Thanks Greg that is the info I was looking for. 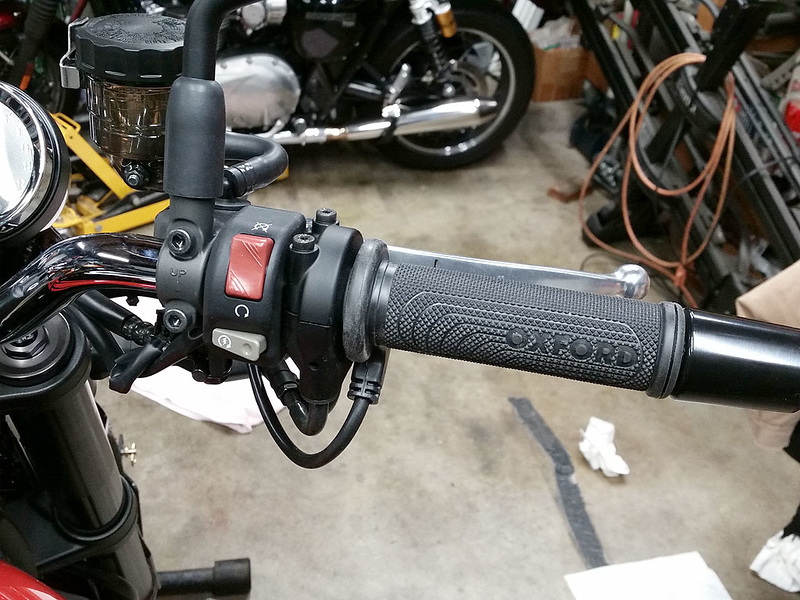 I got my Oxford Premium Sports heated grips installed yesterday. It was a very easy install, just watch the grip glue on the throttle side. The stock grips came off with compressed air easily and the fit of the Oxford on the throttle tube was perfect. I was stoked this version of Oxford's controller color matches the OEM Kawi switch gear perfectly. That looks GREAT and not too large for the controller. I was in a local bike shop that has this on display with another brand...boy...at half heat it was WARM!! at full it was HOT..like hot summer sun blazing on BLACK seats in a closed car HOT!! I think you're good to sub zero temps with those puppies!!! Yes, what I really like about the Oxfords is they offer a wide range of heat from just warm to HOT with 5 levels of heat. They are also well balanced left to right, both grips run the same heat which is not always the case. I've had several sets of heated grips, various OEM, Heat Demons, and this is my 3rd set of Oxfords. By far the Oxfords are my favorite so far. Their kit is clean with high quality molded grips, waterproof connectors, and a fused link that hooks to the battery. Thanks for the info and feedback. I've never personally owned a bike (or installed any) heated grips so that info from someone who has is invaluable to me. I was thinking of installing a set for the early spring rides and late fall jaunts. As I get older my hands do cramp up a bit and I think it's more from the COLD then anything else. So heated grips might be the answer. I've toyed with the idea of heated clothing but mostly it's my hands and or feet that have an issue. And most inner lining in coats help with keeping the body itself warm enough. I've seen the install and it seems easy enough and the compressed air seems to be the way to go to remove old grips by most...might have to look into a set...there is a spring show coming up early April here so I imagine I can find a good deal on ones then..